Lucky me! Thanks to dollar strength, the ascending trend line that was holding up the rising wedge pattern on the Cable broke yesterday, pushing it over the cliff to drop to 1.5900. I got pretty lucky, as the pair made a false break to the top before shooting down late in the European session. With the BOE interest rate decision coming up, it’s time to close my any open positions I have, be it a win or loss. I don’t want to turn this winning trade into a losing one. Besides, I don’t think I can watch price action because I got work tomorrow – even lady traders need their beauty sleep! Ohhh… I see a rising wedge forming on the Cable’s 1-hour chart. 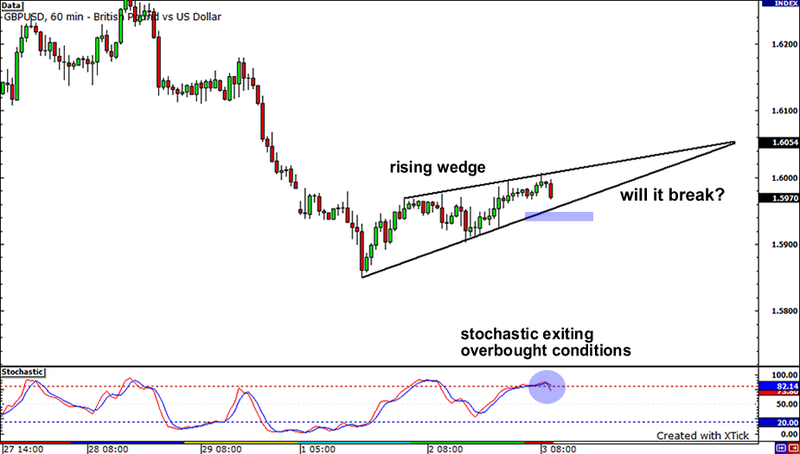 According to forexpedia, a rising wedge is more of a bearish pattern. I’ve decided that, if and when the price breaks down, I’ll be looking to jump in and short the pair as well. The pair looks like it has a lot of room to move downwards, especially with stochastics just coming out of overbought territory. Only the services PMI is due from the UK today, which means that this report could dictate the direction of the pound right until the BOE statement tomorrow. For January, the services sector should continue to expand, possibly at a slightly slower pace than in December. Recall that the manufacturing and construction industries previously reported stronger than expected PMI figures for January. If the services PMI dips below the consensus of 56.6, it could highlight the prevailing weaknesses in the British economy and provide a bearish outlook for the pound. Meanwhile, the US is set to release the ADP non-farm employment change and their ISM non-manufacturing PMI today. Strong figures could give way to more dollar buying during the US session. And most importantly, Taylor Swift bagged Album of the Year in this year’s Grammy’s so I suspect people all over the world will be heading out of their homes to buy her album, which will lead the US economy to recovery. I’m kidding!!! 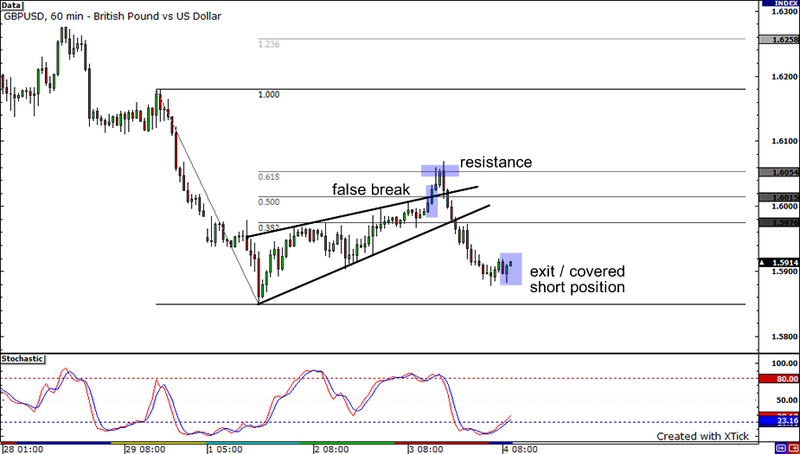 Short GBPUSD at 1.5950, stop loss at 1.6020, take profit at 1.5850. As I always do, I will risk 1% of my account. I am afraid of the BOE statement scheduled for tomorrow though. So, in order to avoid risk and wild price swings, I’ll be closing my trade, whether triggered or not, before then.